This sign will help you learn when to use the past simple vs the present perfect. During a trip to Istanbul I saw this sign outside a café. 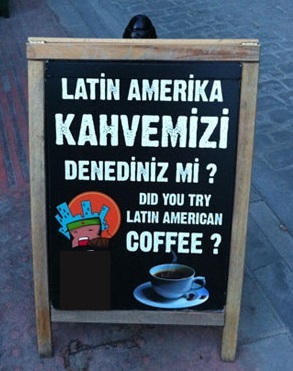 Ignore the Turkish and focus on the English question: Did you try Latin American coffee? First, what is the tense used in this question? The past simple tense is used. The past simple of "try" is "tried." (By the way, tried is irregular. If you need to review how the simple past is formed or irregular verbs, click here for help). Second, is this the correct tense for this question? If so, why is it correct? If not, why not? The sign does not use the correct verb tense. Actually, it should say "Have you tried our Latin American coffee?" but that's not the important point. What's important is to understand why we use the present perfect in this example. When the sign is in the past simple tense, the question would be referring to a specific, completed event in the past. That's the purpose of the simple past. So the sign is confusing. Did I try Latin American coffee? What are you referring to? What event are you talking about? This would be a strange question to have on a sign outside a café. That would be correct because the question refers to a specific event in the past. Your friend's cup is empty so this event would have happened a few minutes or an hour ago in the past. At any point in the past (whether last night or last month or two years ago), did you try this type of coffee? The exact point in time is not important. What is important is whether or not you have ever tried that type of coffee before. Did you try it at least one time before? To be even clearer, the café wants to emphasize they have something new. Latin American coffee isn’t popular in Turkey. They know many people have never tried it before—perhaps they didn't know anyone sold Latin American coffee in Turkey. So the café wants to highlight this to people walking past the café to get their attention and get them interested in trying something new. Past simple: Use for a specific event in the past. Present perfect: Use for an event that happened anytime in the past. The present perfect is often used with "ever" and "never" to talk about experiences up to the present. We also frequently emphasize something that has happened by using already or not happened by using "yet". – The waiter hasn’t brought the bill yet. – Don’t worry, I’ve already paid it. On a separate paper, write the correct answer in the blank line, choosing between the past simple or the present perfect. Jen: Oh, I love that place! Stan: No, I don’t like regular drip coffee. I only like espresso drinks, like cappuccino or lattes. Stan: Okay, if you think it’s that good I’ll give it a try. Shall we go this afternoon? Jen: Great idea. It’s a plan, Stan. So, have you ever tried Latin American coffee? When was the last time you drank coffee? I'd love to know. I've also created an infographic on the past simple vs present perfect that is useful to student.